Malcolm Lowry’s 'Under The Volcano' (1947). Malcolm Lowry’s cult novel portrays Geoffrey Firmin, an ex-Consul living in Mexico who slowly drowns himself in alcohol – thus consciously committing slow suicide – and yet who is unexpectedly killed under unforeseen circumstances. Yet, all ‘universal’ novels are not good novels. What makes the difference here is that the novel works, it creates a powerful reality. Blending a drunkard’s visions with ethylic sarcasms expressed in free reported speech interspersed with Spanish sentences and quotations from Dante’s 'Inferno', Malcolm Lowry also makes perfect use of time and space in order to achieve maximum effectiveness. 'Under the Volcano' is a one-day novel such as Joyce’s 'Ulysses' or Virginia Woolf’s 'Mrs Dalloway': the Consul’s story takes place in twelve hours, from 7am (in chapter 2, as Yvonne arrives in Quauhnahuac, there is a “seven o’clock morning sunlight”) to 7 pm (in chapter 12, when the Consul is shot by the Chief of Rostrums, “the clock outside quickly chimed seven times”). The novel itself (not the Consul’s story) lasts a whole year: in the first chapter, we meet Jacques Laruelle and Dr Vigil one year after the actual events. Laruelle recalls the Consul’s death which is the story we are going to read. These two parts (i.e. the novel as a whole and the story of the Consul) are linked by the repeating of the sentence “a bell spoke out: ‘dolente…dolore’”, and by the fact that Laruelle is reminded of the Consul’s story because it had taken place on the same day of November, the Day of the Dead, of probable pre-Colombian origin, a very important holyday in Mexico. Families picnic in cemeteries, decorate the graves of their loved ones, children play with skeletons made of chocolate and even people dress up as skeletons. This choice allows Lowry to use the event (Laruelle, as Mexicans do, recalls ‘his’ dead, the Consul). It dramatizes the Consul’s fate, packed into twelve hours, creates a larger-than-life dimension, and conveys a strongly expressionistic vision of fate - there are ‘signs’ everywhere - and death. The Consul’s story never ends: once we get to the end, we actually get to the beginning of the novel when Laruelle remembers what we have just read. It is symbolized within the novel by the Ferris wheel of the fair: “Over the town, in the dark tempestuous night, backwards revolved the luminous wheel”). This particular use of time, Lowry said, is “essentially trochal…the form of it as a wheel so that, when you get to the end…you should want to turn back to the beginning again” (Selected Letters, 88, cited in Sherill E. Grace’s 'The Voyage That Never Ends, Malcolm Lowry’s Fiction', Vancouver: U. of British Columbia Press, 1982). This feature of Lowry’s novel is important: the cyclic time represented as a wheel is a reminder of Aztec religion (cf. Jacques Soustelle’s 'Les Quatre Soleils', Paris: Plon, 1967) and fits perfectly with the Consul’s obsession with black magic and cabalistic signs. Within this cyclic and ‘horizontal’ representation of time, within the year and the twelve-hour time span of the novel, Lowry introduced deep ‘vertical’ incursions into the main characters’ past: the Consul’s life is recalled by his friend Laruelle whom he met as a teenager (chapter 1), whereas Hugh’s and Yvonne’s are respectively exposed in chapter 5 and 9. This is meant to present the roles of the other dramatis personae (just as in any ‘classic’ novel) but also to draw their respective psychological features and their importance in Geoffrey’s life and as ‘counterpoints characters’ to Geoffrey’s – Yvonne and Hugh follow the same desperate pattern as Geoffrey. It puts emphasis on the metaphysical dimension of the novel: this is mankind’s destiny. Another important fact in relation to the use of time in 'Under the Volcano' is that the story takes place in November 1938 (whereas Laruelle ‘dreams’ the Consul’s tragic end in 1939), a few months before the beginning of World War II. This element gives yet another oppressive climate to the story, as if through the lives of the characters we should feel the world in a state of decay, falling into chaos, as though we should understand the causes for the oncoming war. 'Under the Volcano' describes a world on the verge of collapsing, of committing suicide – just as the Consul is. 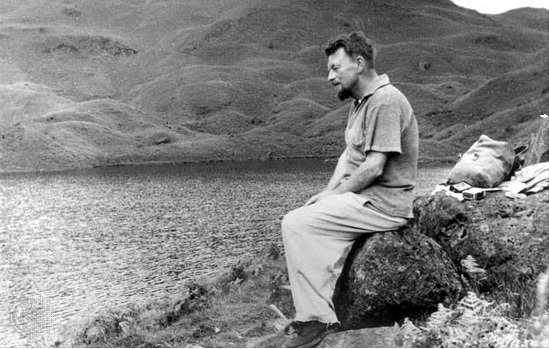 Lowry intentionally named his novel 'Under the Volcano' and situated the action in a country where, according to Aztec mythology, two legendary volcanoes, the male Popocatepetl and his “wife” the female Ixcctacíuatl, eternally watch over mankind, and are strong symbols of the precariousness of life as well as of the impending death of simple humans. He also deliberately chose to place his characters in Quaunahuac, the Aztec name of contemporary Cuernavaca, because the name conveys a strong ‘Aztec’ motif, with all its connotations. The choice of Mexico was also very convenient for Lowry, for he had to ‘kill’ the Consul: Mexico with its history (“so far from God, so close to the United States”), its Revolution, its complex politics, its traditional violence and its poverty was the ideal place to get the Consul into trouble - as Lowry himself had been while in Mexico - and especially to create the Consul’s ironical end, a man who consciously destroys himself with alcohol and yet gets killed under totally unexpected circumstances. The scene is Mexico, the meeting place, according to some, of mankind itself, pyre of Bierce and springboard of Hart Crane, the age-old arena of racial and political conflicts of every nature, and where a colourful native people of genious have a religion that we can roughly describe as one of death, so that it is a good place, at least as good as Lancashire or Yorkshire, to set our drama of a man’s struggle between the power of darkness and light. Its geographical remoteness from us, as well as the closeness of its problems to our own, will assist the tragedy each in its own way. We can see it as the world itself, or the Garden of Eden, or both at once. Or we can see it as a kind of timeless symbol of the world on which we can place the Garden of Eden, the Tower of Babel and indeed anything else we please. It is paradisiacal; it is unquestionably infernal. (Cited in George Woodcock’s article 'The Own Place Of The Mind: An Essay in Lowrian Topography', in Anne Smith’s 'The Art Of Malcolm Lowry', London: Vision Press Limited, 1978). - its hot weather, its sun, are felt deeply by the reader and emphasize the oppressive climate of the book, conveying Judaeo-Christian visions of an omnipresent punishing God as well as terrifying images of the Sun God the Aztecs had to ‘feed’ with human blood lest it should die, thus emphasizing the inescapable fate of the doomed Consul. Geoffrey Firmin is doomed, he is meant to die soon and is already entering Hell. Time and space in Under The Volcano play a major role in its powerful beauty: by using them in his own personal way, Lowry achieved a very symbolic and expressionist world. If the novel still stands out as a cult book and a major novel of the twentieth century it is in great part due to its ingenious use of time – precise yet ‘timeless’ – and to Mexico and the Day of the Dead. Sherill E. Grace, 'The Voyage That Never Ends: Malcolm Lowry’s Fiction', Vancouver: University of British Columbia Press, 1982. George Woodcock, 'The Own Place Of The Mind: An Essay In Lowrian Topography', in Anne Smith’s 'The Art Of Malcolm Lowry', London, Vision Press Limited, 1978. The Owl and the Nightingale (circa 1210) - original text in Middle English. The Owl And The Nightingale (circa 1210): a comparative critical approach. Vampires, sorrows and sophisticated ennui: the cultural side of tuberculosis.